There are people who are experts at party planning. I know some of them personally. I respect and admire their skills. 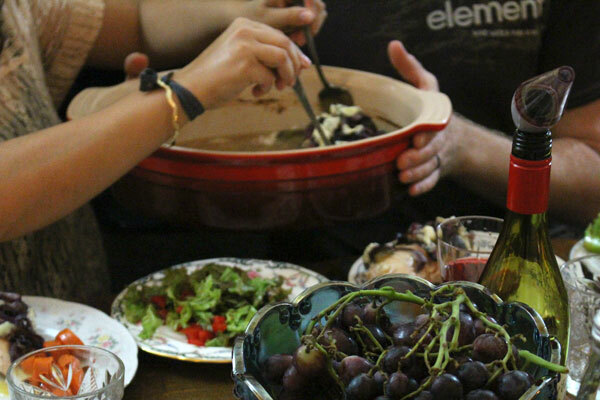 I do, however, love to menu plan and enjoy spending time with friends and family. One of my favorite things to do when hanging out is eat. Food makes things even more fun, so says me. We are fortunate to have access to amazing organic produce. Our weekly menu is generally planned around what we get in the box. So are the dinner parties that we throw. And what’s more fun than a themed dinner party?! Maybe lots of things… but I sure enjoy them. For this first event we kept it small. Six friends: Dave and Bekah, and Nolan and Joanna, and us.Ã‚ I was inspired to get creative with roasting fruit. Figs and grapes are in season right now and are both so yummy when roasted. They get this deep, rich sweetness that is so different from eating them fresh. They are the main component to this meal. All the other dishes were created to compliment them. 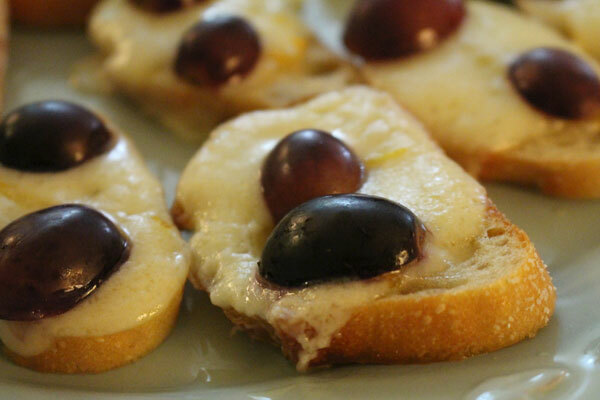 For our appetizer I made crostini with grapes, havarti cheese, and one sliver of lemon zest. They were gooey, bright, and really tasty (or so I gather – of the 18, I only got 1 ;)). I made a simple salad with lettuce and tomatoes. The dressing was a basic vinaigrette with olive oil, balsamic vinegar, maple syrup, and roasted garlic. 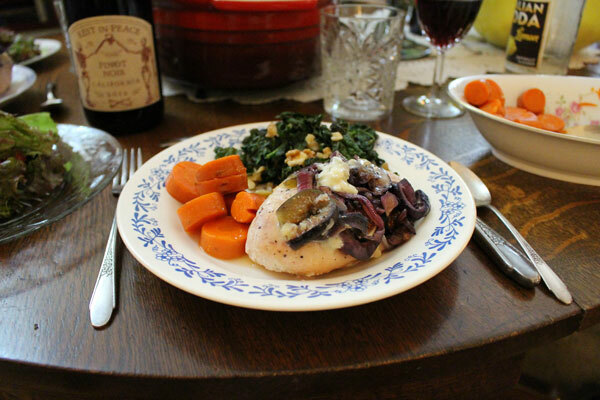 The main dish was Roasted Chicken with Gorgonzola and Figs. The chicken was topped with figs, salt, pepper, andÃ‚ browned butter (which I had to make twice because I burned it the first time), then roasted for about an hour. For serving, sweet caramelized onions and tangy gorgonzola cheese are piled on top. I made two sides. One was more of a classic; a simple every day dish. Steamed carrots with butter and honey. But, they didn’t taste normal or boring. 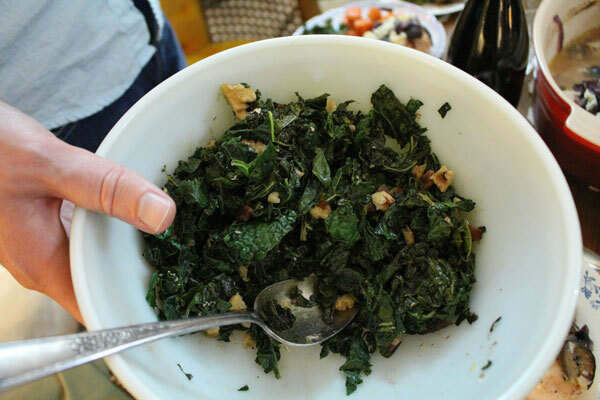 The second side was wilted kale with walnuts and bacon. Ok so bacon (good bacon) is always a winner in my book. In this dish it was no different. The bacon worked so well with the nuts and the wilty wilty greens. And then, dessert. This may have been my favorite part of the meal, and I’m not a sweets person. I roasted some figs. 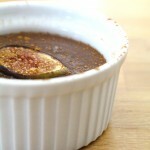 Nothing on them – just figs, parchment paper, and a 375F oven. I melted some chocolate over a double boiler (which was actually a glass bowl resting on a pot of boiling water). I whipped some cream, sweetened slightly by coconut palm sugar, with a hint of vanilla. The figs were a bit crispy, kinda caramelized, super deep and sweet. They’re topped with whipped cream and drizzled with chocolate. 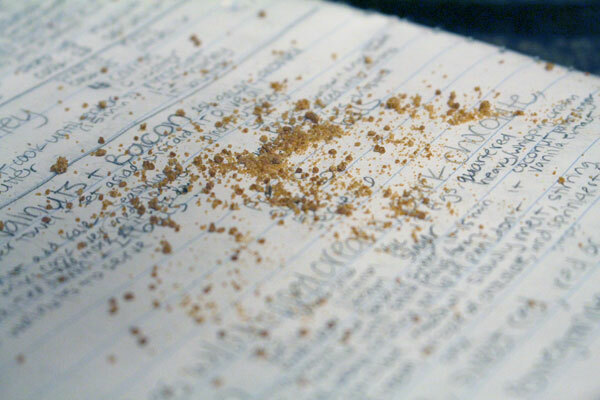 Then cinnamon is sprinkled over it all. Not too much, just a hint. Let my friends contribute. Making all the food myself is a daunting task. Write out a plan. Figure out what can be made ahead of time (the day before, the morning of). It helps things run a lot smoother and allows for less panicked, more relaxed cooking. For example, I made a list of things that could be done early (you don’t have to make a list, I just love lists). Then in the morning I chopped fruits and veggies, roasted the garlic, cooked the bacon, and made the salad dressing. It made the afternoon much less stressful. Have an appetizer for guests to snack on while I finish last minute preparations, photographing, and setting up. Relax and enjoy all your hard work. Last modified on 2013-10-27 23:51:41 GMT. 0 comments. Top. Place slices of baguette on baking sheet. Drizzle with olive oil. Top with cheese, lemon rind, grapes, and salt. Bake for 10-15 minutes, or until cheese is melted and bread is crispy. Last modified on 2013-10-27 23:51:50 GMT. 2 comments. Top. Drizzle garlic with olive oil and wrap in foil. Roast for 45-60 minutes. Remove from oven. When cool enough to handle, squeeze pulp from 3 cloves garlic and mash with a fork. Set aside. Whisk together garlic, balsamic vinegar, salt, pepper, maple syrup, and dijon. Slowly stream in olive oil, whisking as you do, creating an emulsion. Last modified on 2013-10-27 23:51:44 GMT. 0 comments. Top. 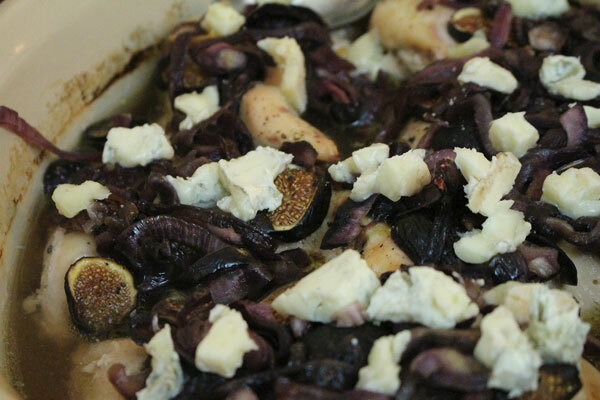 Chicken is roasted with browned butter and figs then topped with some sweet caramelized onions and tangy gorgonzola cheese. Drizzle garlic with olive oil and wrap in foil. Roast for 45-60 minutes. Remove from oven. When cool enough to handle, squeeze pulp from 6 cloves garlic and mash with a fork. Set aside. Brown butter in a small skillet (watch carefully so it doesn’t burn). Grease a large ovenproof dish. Add water. Add chicken. Top with figs, salt, pepper, and then drizzle browned butter over. Bake uncovered for 45-60 minutes, or until internal temperature of chicken reaches 170F. Add onions and honey to a dry skillet. Cook over low heat for 30-40 minutes, stirring occasionally. 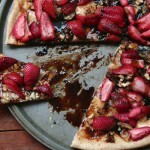 Remove from oven and top with mashed roasted garlic, caramelized onions, and dot with gorgonzola. Last modified on 2013-10-27 23:51:45 GMT. 2 comments. Top. Add water to the bottom of a pot with a steamer basket (about an inch deep, or not touching the bottom of the basket). Add carrots to the steamer basket. Cook until tender, about 15-20 minutes or so. 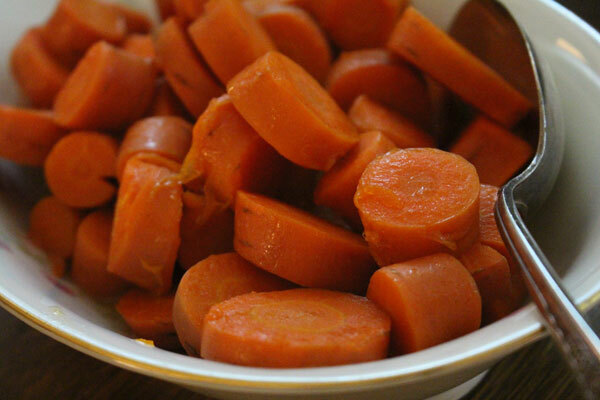 Toss carrots with salt, honey, and butter. Last modified on 2013-10-27 23:51:48 GMT. 0 comments. Top. Cook bacon. Drain on paper towel. When cooled, crumble and set aside. Discard fat from pan (or reserve a bit for cooking). Add olive oil (if all bacon fat was discarded), when hot, add kale and some seasonings. 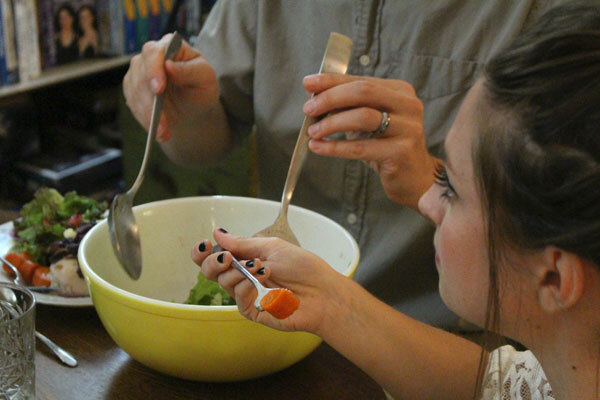 Use tongs to turn and mix kale, as it wilts down, add more kale and more seasonings. Cook over medium-low heat for about 10-15 minutes, or until all kale is wilted. Add 2 T balsamic vinegar. Taste and adjust seasoning if needed. Serve topped with walnuts and bacon. Figs are roasted and topped with a cloud of whipped cream, a drizzle of chocolate, and a sprinkle of cinnamon. Line a baking sheet with parchment paper. Place figs on baking sheet with a bit of space between them if possible. Roast for 10-20 minutes, or until figs are slightly crispy and caramelized. Whip cream with sugar and vanilla using an electric mixer or by hand. Whip until stiff peaks form. Heat about 1 C water in a pot. Place a bowl in the pot - it needs to be large enough so that it rests on the edge of the pot on its own and does not touch the boiling water. Break chocolate into pieces in the bowl. Stir with a spoon as it melts. Once melted, remove from pot (carefully, bowl will be hot). 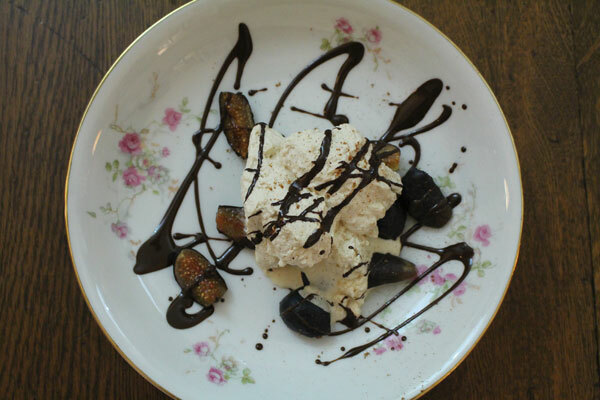 Spoon figs into a bowl and top with whipped cream, a drizzle of chocolate, and a sprinkle of cinnamon. Serve immediately.